The new NOW TV Kids Pass has a free 14 day trial and afterwards is only £2.99 a month. The whole service is completely aimed at children, even down to the menus/navigation, which are not only colourful and fun, but also have pictures so your child can easily spot their favourite programmes. 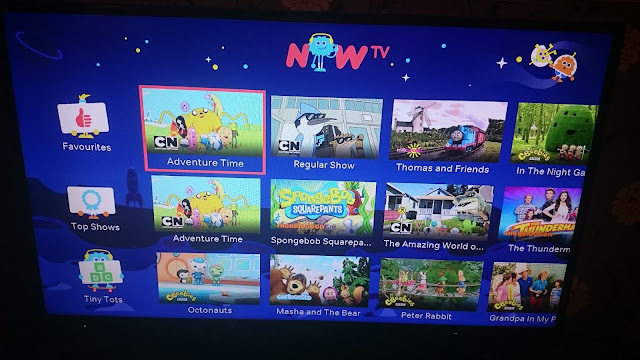 There's also favourites menu that cleverly stores the most watched programmes so your kids can get back to them quickly & easily. One feature I've loved so far about it, is the fact that it auto plays the next episode in the series, so no angry kid waiting for you to find the next episode, they can just carry on watching! Of course, I've not yet mentioned set up, but one word really describes it perfectly... SIMPLE! Just 2 wires and the box to contend with in the box - one being the power lead, the other the HDMI cable for connecting to your television. It's really as simple as that. No fiddly installations, no technical know how required. Then pop your batteries in your remote and off you go. 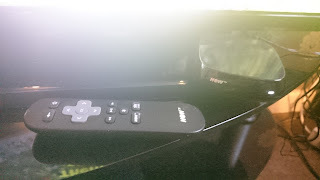 Even the remote control is uncomplicated with just a handful of buttons to use for simple operation. You, of course, need a NOW TV account, but again, it takes just a couple of minutes to set up your NOW TV account. There is plenty to choose from for the kids, for both little kids & older kids alike. Marley is almost 2 now (he will be in just 8 days), he loves watching telly. 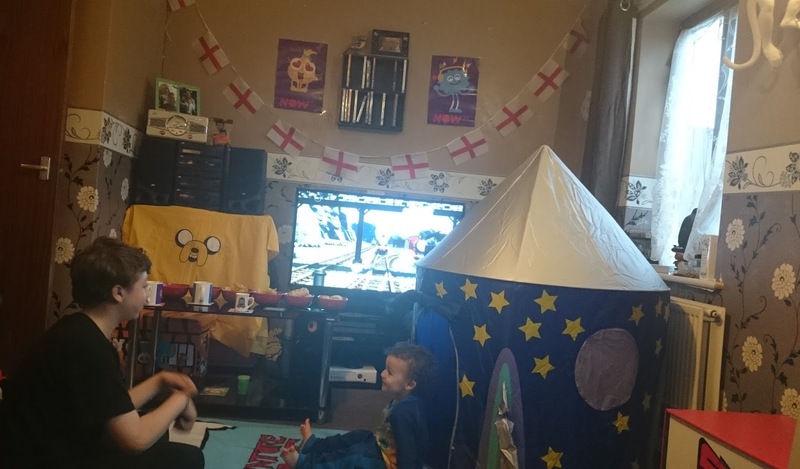 He loves CBeebies in particular and so he loves being able to watch In The Night Garden & Waybuloo, but he's discovered some new favourites like Ollie The Little White Van and Paw Patrol, and old favourites such as Thomas The Tank Engine and Fireman Sam too. The best thing is, unlike the actual CBeebies channel, it doesn't end at 7pm, meaning they can carry on until they get tired! David is 13 and just because the theme is maybe aimed at younger children, there is plenty for him to watch too. 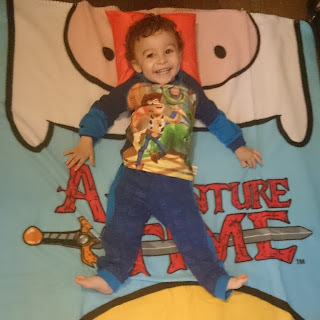 There's Nickelodeon and Cartoon Network - so he was happy to be able to watch his favourites such as Regular Show and The Amazing World Of Gumball. There are lots of programmes available on demand and you can also watch 6 live TV channels too. 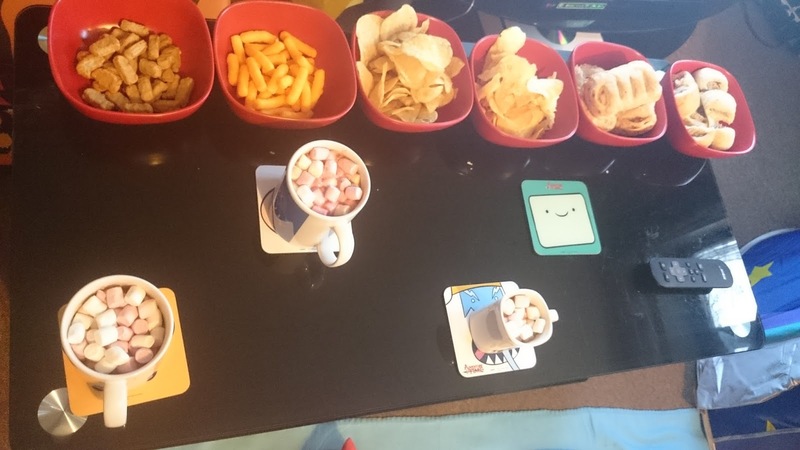 We decided to have a fun family night with the goodies we received to help us make it as fun as possible. We had some snacks in front of the telly. There were 2 NOW TV mugs and some hot chocolate so both me and David had those, while Marley had some juice in his NOW TV plastic cup. Marley had lots of fun lying on his NOW TV cushion in front of the telly and lying on the Adventure Time blanket. Marley had lots of fun with his big brother (David) playing in the rocket pop-up tent, they sat in it and watched telly, then afterwards they had loads of fun playing in it too. Both David & Marley have enjoyed being able to pick and choose what programmes they want to watch and when they want to watch them! And I have to say, it really is a bargain for £2.99 a month! I will definitely be carrying on with my subscription as it makes both the boys happy. Why not go an sign up for the 14 day free trial and see if your kids love it too! If you don't have kids, or if you want something a bit more grown up, NOW TV also offers other passes such as the entertainment pass which costs £6.99 a month, the movies pass which costs £9.99 a month or various sports passes that start from £6.99. Of course another positive is, you can register your NOW TV on 4 devices and watch on 2 different devices at the same time.It's available on a NOW TV box, PS4, PS3, XBox One, compatible Roku boxes, Chromecast, LG Smart TV, PC, Mac, Mobile, Tablet and more! It's so great that both David and Marley can find something they like. And your photos! Marley looks over the moon on his blanket, such a sweetie!